Florida Gators football kicks off 2016 spring practice on Wednesday, the first of 15 times the team will get together for on-field work. Despite the numerous necessary transitions as Florida changed coaches last season, there are plenty more adjustments to be made for the Gators entering 2016 considering the number of players that departed the program over the last few months. Head coach Jim McElwain offered some limited insight ahead of the start of practice, and OnlyGators.com is breaking it all down with these things you need to know before the offseason program gets underway. 1. Favorite by default: The Gators technically have five quarterbacks on the roster but only four will be competing in the spring and just one even practiced with Florida last year. That was redshirt sophomore Luke Del Rio, who remains a walk-on after joining the team a year ago and taking a redshirt as a transfer from Oregon State. Considering Del Rio’s familiarity with the system, McElwain relented that he has the early inside track on the job. His primary competition will be graduate transfer Austin Appleby (Purdue), though a pair of freshman early enrollees in four-star Feleipe Franks and three-star Kyle Trask will be part of the battle. 2. Speaking of early enrollees: It is believed that UF has a record 12 new players joining it for spring practice. “You can feel their energy and excitement,” McElwain said, “which is kind of contagious with the rest of the guys.” What’s interesting about the group of 12 is how the positions stack up with two aforementioned quarterbacks, three wide receivers and two defensive backs all expected to see a large number of reps over the course of the next month. 3. Oh yeah, the injuries: Aside from the suspensions, the Gators will see four other players completely miss spring practice, including three potential starters. Junior wide receiver Brandon Powell (foot) and sophomore left tackle Martez Ivey (shoulder) are sidelined while still recovering from surgery, as are a pair of kickers in redshirt sophomore Jorge Powell (torn ACL) and redshirt senior Austin Hardin. On a positive note, senior linebacker Alex Anzalone has been cleared for non-contact drills after missing most of the season with a serious shoulder injury. “He had a real bounce in his step when he came back with the news,” McElwain shared. “In fact, he texted me on my birthday to let me know – just you could tell the excitement that was there that this is finally over.” Junior cornerback Quincy Wilson and senior defensive lineman Joey Ivie are presently limited while recovering from hernia surgery but should eventually be able to go. 4. Maybe the hype is real? One positive to the kicker injuries is that redshirt sophomore transfer Eddy Pineiro will basically get every single rep in the spring. His strong leg and trick shots have received plenty of views online, but now is the time to see if the inexperienced kicker can make field goals and extra points in game-like situations. It will be more than the veterans getting a ton of reps as four-star freshmen Joshua Hammond and Freddie Swain will have the chance to breakout this offseason just as Callaway did a year ago. There’s no longer a shortage of bodies, just an absence of proven effectiveness. 7. 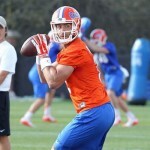 Fixing a return problem: Callaway’s absence means UF is without a punt returner. Powell’s ineffectiveness in 2015 and spring injury means the program is also missing a kick returner. Enter JUCO WR transfer Dre Massey, a speedy player who caught passes, rushed the ball and returned both kicks and punts for Holmes Community College last year. To say Massey is expected to contribute right away on special teams would be an understatement. “He’s a guy that’s going to be able to play multiple positions for us, one of those being a return guy. I’m looking forward to seeing Dre catch it and go with it,” McElwain said. 8. Establishing a new identity: With so many personnel losses on the defensive side of the ball, Florida’s defense may not look like the dominant unit fans have been used to. Wilson, junior cornerback Jalen Tabor and redshirt senior safety Marcus Maye will be back in the secondary, but UF has depth problems there with freshmen Chauncey Gardner and McArthur Burnett both needed to develop over the next month. At linebacker, the Gators look to senior Jarrad Davis to lead the way for a unit filled with inexperience. In fact, McElwain confirmed Tuesday that redshirt freshman Kylan Johnson will move down from the backfield into the linebacking corps in order to help improve the depth and potentially make an impact. 9. Plenty of bodies, but … Florida has 16 scholarship offensive linemen on the roster, most of which will be able to participate in spring camp. On its own, that’s a major improvement from a year ago. The issue? Well, the Gators have little idea what they’re going to get from the vast majority of those players. 10. Some early motivation: As if Florida does not have enough reasons to give maximum effort this spring, McElwain expressed Tuesday that he is still incredibly salty as to how his team ended its season, particularly in the 2016 Citrus Bowl. “It makes you really excited to get going in spring ball and get that taste out of your mouth, a miserable taste that was embarrassing. It was embarrassing the way we played. It was embarrassing the way we took the field. It was embarrassing the way we laid down,” he said. Goolsby All-SEC tight end this year. Davis will go in the first round of the NFL draft next year. Kudos to Coach Mac for telling it like it is regarding the Citrus Bowl. I still can’t believe what I saw. I thought that team had way more heart than that.